A male and female suspect are being investigated for a string of thefts in southeast Saskatchewan and southwest Manitoba. Above and right, video surveillance from a Virden business. Far right, stolen alcohol from the Twin Valley Co-op in Elkhorn, and other items, left in an abandoned stolen vehicle. RCMP are investigating a string of break-ins in Virden, Elkhorn, Moosomin, and Rocanville that appear to be related. In the last week, between Moosomin and Virden Detachments, there have been seven reported break and enters and three thefts of vehicles. Police believe that all of the incidents are related and were committed by the same suspects. On Tuesday, Oct. 9 at 11:45 pm there was a break in at Deckers H20 in Rocanville, where the suspects stole $4,000 worth of alcohol. 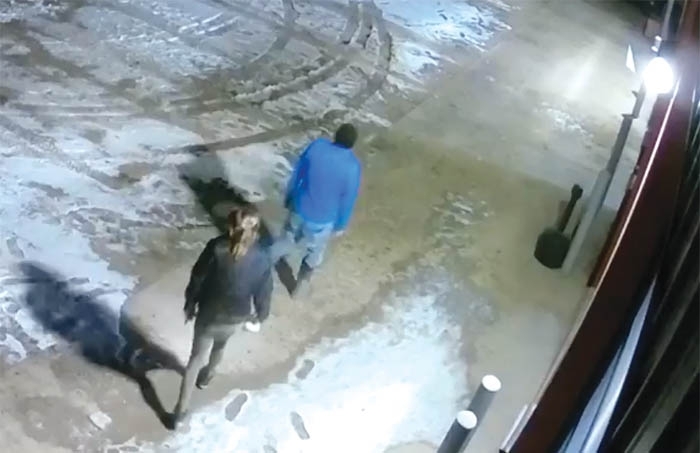 Video surveillance from Deckers show a man and a woman breaking into the store. A truck was also stolen that night. The same suspects are believed to be responsible for a string of thefts on the night of Sunday, October 14 and the morning of Monday, October 15. A truck was stolen from a local business. The stolen truck was used in a break-in at Twin Valley Co-op in Elkhorn, where the truck smashed through the front doors. Alcohol of a value of $1,600 was stolen from the Co-op, including a $500 bottle of vodka that had been ordered in for a social. There was damage done to the Co-op store front, and Twin Valley GM Dwayne Moncor said the Co-op will make changes going forward to prevent a truck from being able to go through the doors. The Co-op will have to replace the front door frame. Then a truck was stolen from another business, where clear video shows a man and a woman committing the break-in. The video was shared Monday on the World-Spectator’s Facebook page and led to some tips. The first stolen vehicle was then abandoned with the stolen alcohol in it. There was a break-in at Davidson Truck and Tractor by the same suspects, but nothing was taken. In addition to possible IDs based on the video surveillance, police have been able to retrieve fingerprints from the stolen alcohol bottles, and retrieve personal items left by the suspects. Police feel that they may be close to an arrest in this case, based on that evidence. Fefchak says it appears clear that the recent rash of thefts are all related. He suggested that businesses should invest in high quality video cameras, as that can help identify suspects.